It looks like the latest version of WordPress 5.0.3 has destroyed our individual Chicago dog parks pages (which were using the Multiple Content Blocks plugin). Crap. We’ll try working on reconstructing them, but so far… oof. This is tough news. Update: reverting to v4.9.9 has saved us, so far. Update: looks like there’s a workaround – will deal with this over the weekend. Our friends at the McKinley Dog Park Advisory Council (Facebook) have been working on getting a dog park at Pershing and Western in the McKinley Park neighborhood since 2014. They’re holding their first fundraiser on Saturday 14th, 2018 from 6-9pm at Co-Prosperity Sphere, 3219 S Morgan St.
Get your tickets now and join them at this fun event! The Chicago Park District recently tested for lead levels in its water fountains around the city. There’s no information about d’Angelo Park DFA – that park is still under the control of CDOT. 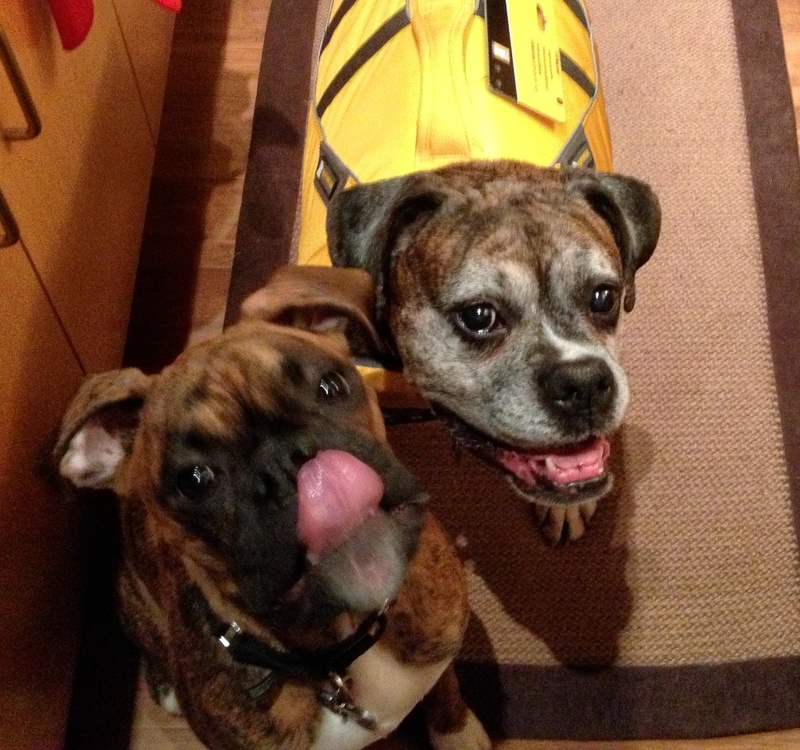 Introducing the South Loop Dogs of the Week, Blu and Louis! Blu and Louie love Fred Anderson Dog Park! Blu is quite the attraction as he is obsessed with the fountain, barking and trying to eat the water, while Louie loves to chase and be chased! Blu is the newest addition to our family, having adopted him from a rescue in Yorkville in April, Louie and I are very lucky and grateful for Blu! Louis is the white dog with the black face, in back, and Blu the smaller black dog, in front. They sure have a lot of toys!! 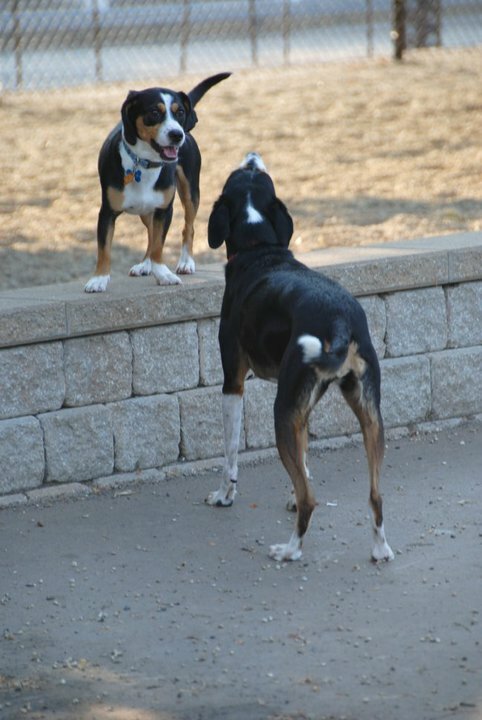 An email from a user of Grant Bark Park brought to our attention the need to talk about park safety! We all want our local dog parks to be a safe, fun space for our dogs and ourselves, but what do you do when the worst happens and another dog attacks you or your dog? The Short Answer: Call the police. According to the Chicago Park District website, all owners are legally responsible for their dogs and any injuries caused by their dogs. If your dog is bitten or attacked, exchange information with the owner of the other dog. Most owners in good faith will offer to pay for your vet bills. If the other owner is unwilling to speak with you, call the police and report the incident. This comes up more frequently than we would like in Chicago dog parks – we hear it from our colleagues across the city – and we’re still trying to come up with a way to improve the information provided to dog park users and to clueless owners. This is a long term project we’ve been trying to get off the ground; we will update you later in the summer as we make progress. Sudden, quick disagreements with lots of noise that end in a matter of seconds are normal and it is probably safe to allow the dogs to remain in the park if neither shows any inclination to continue the argument. Interrupt any situation that seems to be escalating. Use your voice in a calm, commanding way to stop the fight. Screaming simply increases the arousal of the dogs involved. Do NOT stick your hands into the middle of a dog fight to separate dogs. If physical intervention is needed, try to grab the back legs of your dog and “wheel-barrow” it until it calms down. Fighting dogs will often strike at anything that moves near their face and human hands are far more delicate than most areas where one dog will bite another. Do not allow additional dogs to jump into the fight. If you see or hear a squabble between other dogs, get your dog immediately and take it away from the area. Do not panic. It will not help the dogs. Remember that as a general rule, the louder the fight, the more bluff and bluster is involved and the less damage. Most dog fights between similar size dogs do not result in serious injury. Once a fight occurs, the adrenaline levels of the dogs involved, and many of those who witnessed the fight, will be raised for several hours. It is wise to take these dogs out of the park and exercise them elsewhere to avoid the potential of another fight. This is an update of Dog Park Safety: What to do when your dog is attacked posted 8.13.12 on the 16thWabashDogPark blog. When the weather gets warmer…more dogs come out to play! So now is a good time to review the rules and etiquette for taking Fido to the park. Most important of course is to make sure your dog is properly vaccinated and socialized. Puppies under 4 months, dogs without all their shots, and aggressive or extremely timid dogs are best to avoid the dog park. The best way to insure a good time for all, be respectful of your park (clean up after your dog) and always watch your dog. Make sure your pooch isn’t playing too rough or cowering in fear under the park bench. Always be there to protect your dog. 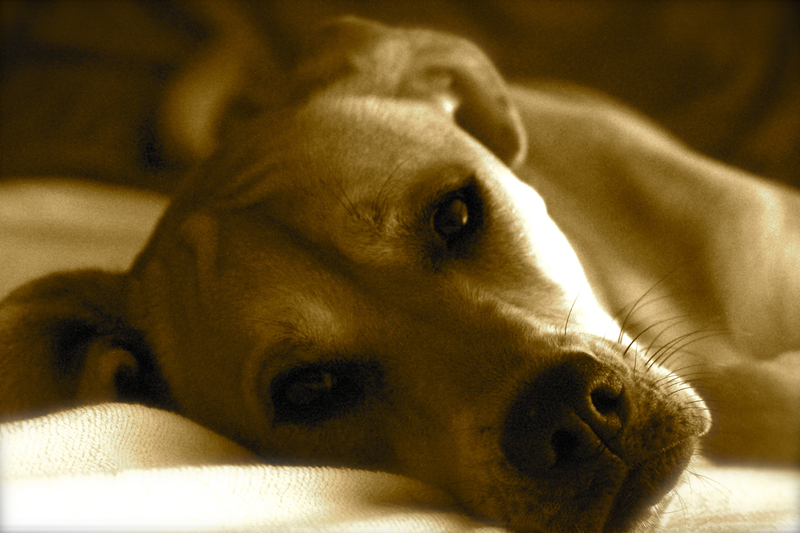 Owners are legally responsible for their dogs and any injuries caused by their dogs. Owners must remain with and watch their dogs at all times. Dogs must be leashed prior to and upon leaving the DFA. Owners must immediately clean up after their dogs. Dogs with a known history of, or who exhibit, dangerous behavior are prohibited. Dogs must be healthy, fully immunized, dewormed, and licensed. No dog will be allowed in a DFA unless it has a current rabies vaccination. Dog owners are responsible for the monitoring and maintenance of the DFA. Owners or other responsible persons must have a DFA permit with them for each dog visiting the DFA. Each dog visiting a DFA must display a current Chicago Park District DFA tag. DFA permits expire on December 31 of the year that it is issued. Children under 12 must be accompanied by an adult; younger children must be closely supervised. Only three dogs per person allowed. Puppies under four months old and female dogs in heat are prohibited. Failure to comply with the Cook County Department of Animal and Rabies Control Regulation for Chicago Park District DFAs can result in a fine. Onto Etiquette…our dog parks will only continue to thrive if we are compassionate and considerate of our dog park neighbors. Don’t discipline another person’s dog, but do remove your dog from an aggressive or inappropriate situation. Play with your dog and pay attention to him, but don’t forget to let him socialize with the other dogs. If you see another dog and their parent about to leave, call your dog over so they can leave easily. Always shut the gate behind you. Talk to people – chat about your puppies and give other dog parents a heads up if you’ve been there for a while and noticed anything unusual or a dog that could be potentially aggressive. Fill the water bowl, take the time to rinse out the bowl and fill it with fresh water if it’s been sitting there for a while. Did we forget anything? What other tips can you think of for making our dog parks a better place? This is an updated version of Dog Parks Rules & Etiquette posted 5/7/12 on the 16thWabashDogPark blog. South Loop Dog Park Action Cooperative &lpar;SLDogPAC&rpar; South Loop Dog Park Action Cooperative (SLDogPAC) shared a post. Congrats to McKinley Dog Park Advisory Council! Looking forward to visiting! Bag dispenser burned up at Grant Bark Park. Filled the bag dispensers at Fred Anderson Park Dog Park and put up new signs with our number to let us know when they need filling! And thanks for the kind on-the-spot $20 donation from a park user! Congratulations to our friend, professional dog trainer Judit Arroyo-Czachor, CPDT-KA, for the publication of her article on helping our city dogs cope with living in big buildings. Wiggles & Giggles Halloween Bash TONIGHT !!! 5-8:00 PM. Doggy goodie bags being assembled, party favors for the kids, and Costume Contest Bags are overflowing! Categories are: Child, Dog, Ensemble (human + canine). Introducing South Loop Dog of the Week, Bijvoet! 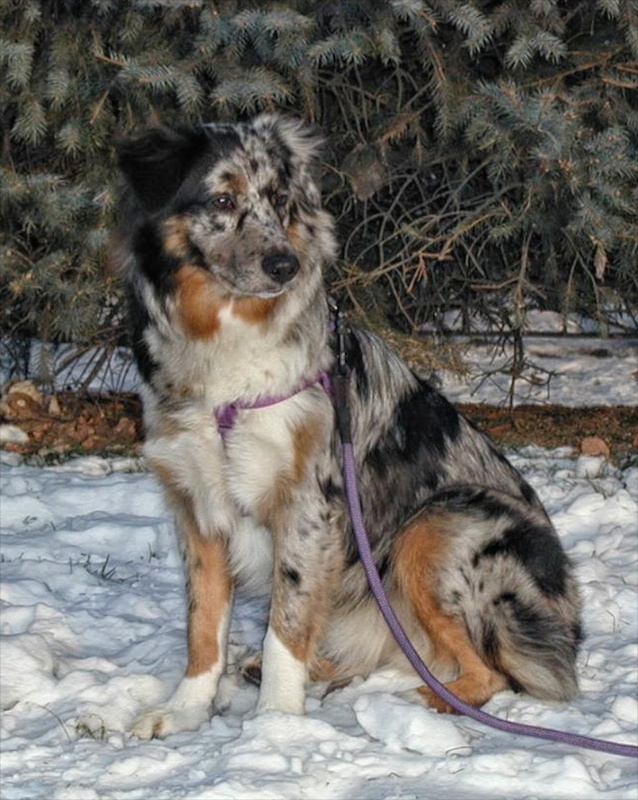 Australian Shepherd Bijvoet (‘bye-foot’) is a bossy, fun, happy dog who loves to play agility, but loves her frisbee and soccer ball even more. This week she’s at the AKC National Agility Championship, appearing for the second time, and she’s doing great! She’s not the fastest dog, but she’s very consistent over the jumps, weaves and obstacles, and she’s now in 71st place out of over 400 dogs! Bijvoet is named after a famous Dutch chemist, Johannes Martin Bijvoet, who worked on the foundations of X-ray Crystallography in the mid-20th Century. Her dog mom Pam is an X-ray Crystallographer! Introducing Lucky and Rita, South Loop Dogs of the Week! Give Me A Cookie, Mom! Lucky likes to visit her brick in the Grant Bark Park and play racquet ball chase, and Rita loves to torment her big sister and play chase, too! Both girls live to cuddle and generally clown around. You can find these girls playing in Coliseum Dog Park on a regular basis! Introducing Tequila, South Loop Dog of the Week! Meet Tequila! Our two year old, fun, loving, snuggle monster! We got Tequila from PAWS about a year and a half ago. She came into PAWS as a stray from another shelter, as she was next on their list to be euthanized. Thank God PAWS got to her just in time, because this amazing pup has changed our lives! When my boyfriend, Patrick, and I first met Tequila, she was a confused, sad-faced, underweight pup. She was hesitant to trust anyone or anything she came into contact with. As for Patrick and I, we had just moved to Chicago and we are both huge animal lovers. Not to mention our new neighborhood in the south loop was ideal for dogs with the numerous dog parks, playgroups, and pups everywhere! After having been through so much in her past, Tequila made a drastic transformation into the happiest, most perfect dog. She brings smiles to our faces each and every day and we absolutely love coming home to our loyal family member. Tequila has such an amazing personality. We often refer to her as being half human but, she loves to go to the dog park and socialize with the other neighborhood pups, too! Tequila made our new surroundings in this city, home. We cannot imagine life without her peppy, uplifting, loving personality. Wow, what a good (and photogenic!) girl! 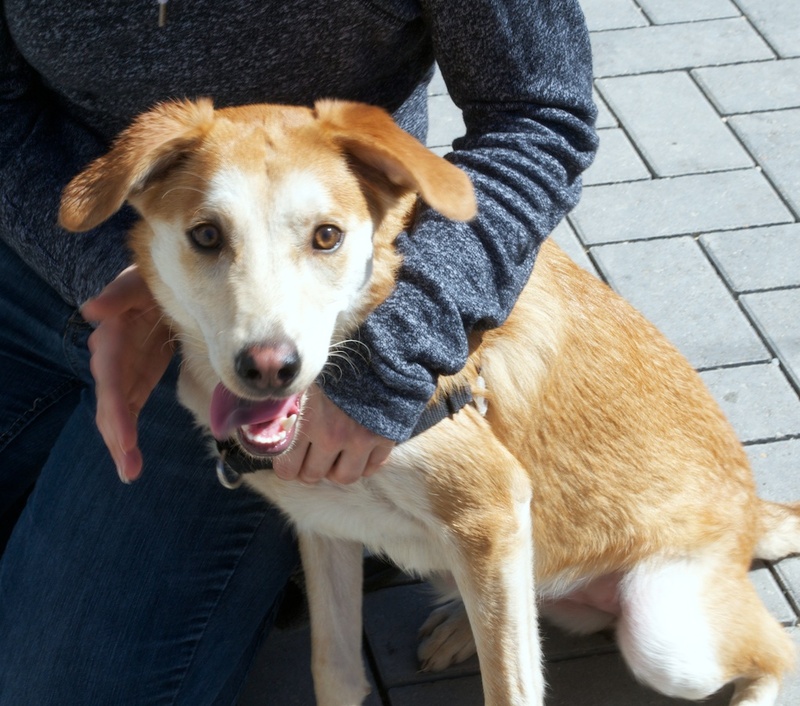 Introducing Ada, South Loop Dog of the Week! Ada’s a shepherd mix originally from Oklahoma. She’s almost one year old and she is super energetic. Ada loves all kinds of chewy toys, especially antlers! She can run super fast and loves to do laps around the dog park with all the dogs chasing her! She tumbles and plays and keeps up with all the dogs, even the big ones. Her owner, Hilary, also takes her running around the South Loop and along the lake. Ada is a regular at the D’Angelo DFA. Introducing Dupree, South Loop Dog of the Week! 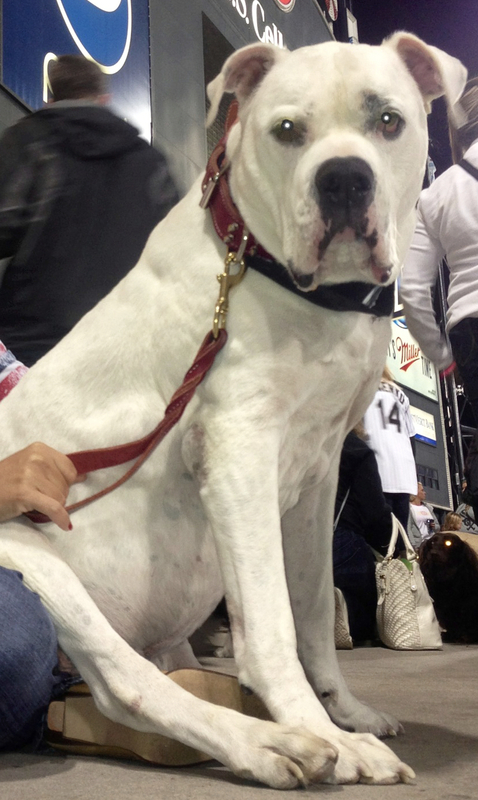 Dupree is an American Bulldog. He’s almost 12 years old and has lived in the South Loop all his life. Dupree’s a favorite at many South Loop parks, and a favorite in his building! He is definitely a gentle giant! Introducing Merlin, South Loop Dog of the Week! 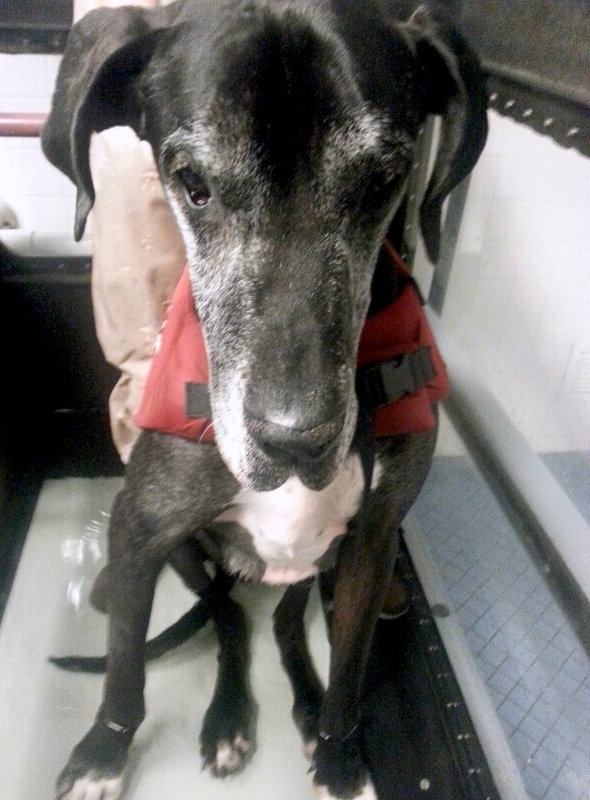 Merlin is a 9 year old Great Dane. 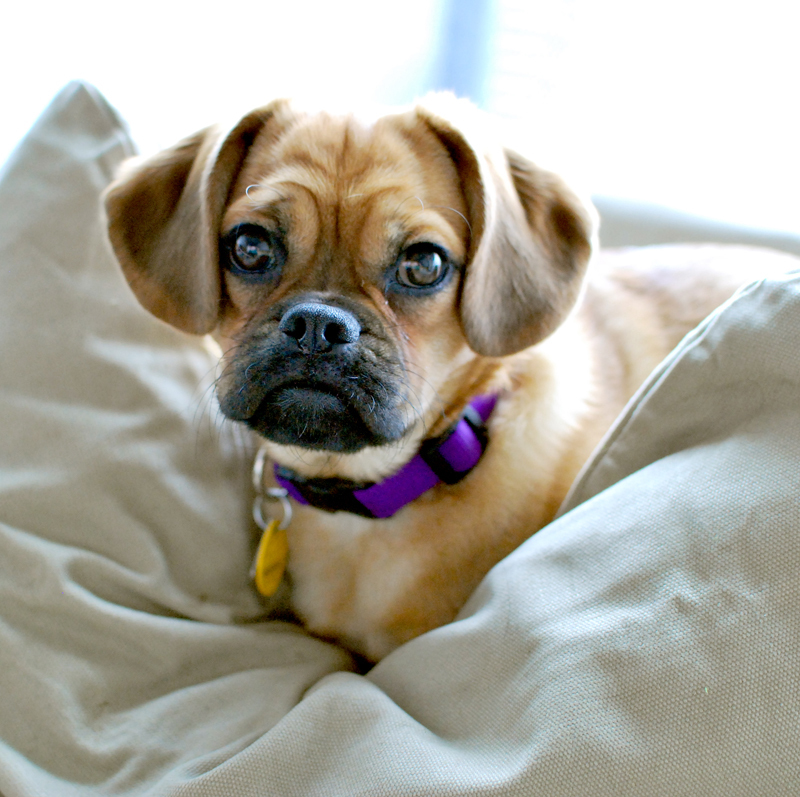 Introducing Daisy, South Loop Dog of the Week! 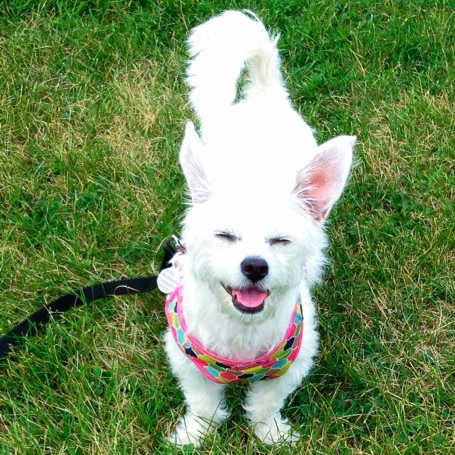 Daisy was adopted from PAWS Chicago almost a year ago, and she brings her pet parents nothing but joy! Is your pup a star? Of course she is! 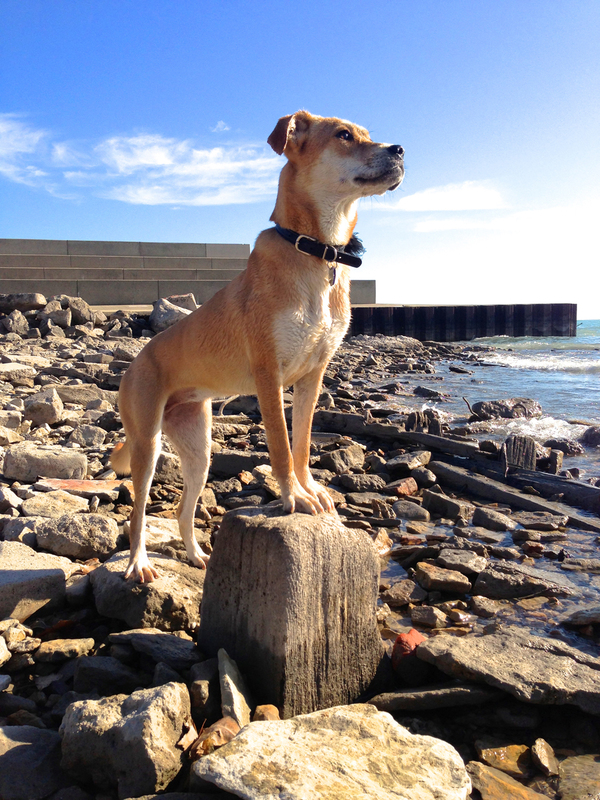 We want to see your dog star as the South Loop Dog of the Week! Just tell us about your pup and email a pic to ‘dotw@southloopdogpac.org‘. South Loop Dog of the Week appears every Saturday at 11AM. Who’ll be the next DOTW! Introducing South Loop Dog of the Week: Bruno! Bruno is one year old. His favorite toys are his stuffed fox and any and all Nylabones and chewy ropes. His favorite dog park is the d’Angelo DFA. A final design proposal for the Fred Anderson Park was presented at a community meeting on November 20th. What follows is a brief description to highlight how the proposed dog friendly area compares to other Chicago dog parks, and to point out some interesting design features. The park will encompass about 1.1 acres. Now, Chicago dog ‘friendly’ areas are small, and this park will be no exception. Frisbee dogs and dogs running free – you will have to go elsewhere. The proposed small-dog area is an oval about 67’ by 94’, and is surfaced primarily (80%) with concrete. 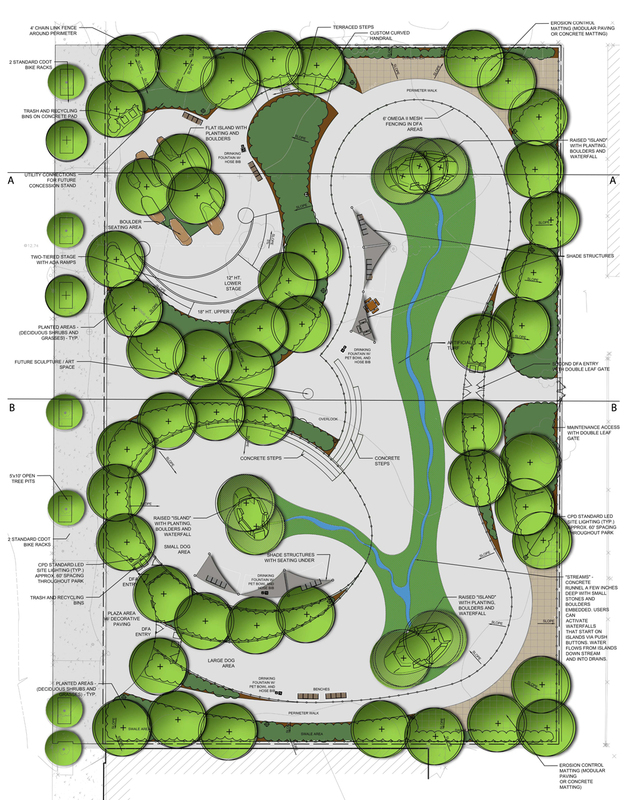 About 18% of the surface will comprise an ‘artificial grass’ feature, a central raised planting, and a water runnel flowing from the planted area towards the center of the dog park. The proposed large-dog area includes an entry space ~20’ wide by 70’ long and a larger ‘fetch’ area running north-south that is ~35’ wide by 226’ long. This fetch area will include two raised plantings (see the cross-section diagram, below), a strip of artificial grass and a water runnel flowing through it. Overall, the small-dog area will comprise ~5200 sq ft (0.12 acre). The large-dog area will comprise ~13700 sq ft (0.32 acre). For comparison, Grant Bark Park is ~18000 sq ft (0.4 acre), and the average size of a Chicago DFA is ~0.18 acre. The Fred Anderson Dog Park now proposed occupies only about 45% of the ~1.1 acre site. This is less than the original design proposal presented two years ago, but is certainly an improvement over the revision that was presented last year. Thus, the proposed Fred Anderson Park dog ‘friendly’ area will be ~three quarters concrete, with only one-quarter of the area as artificial grass or elevated planted features. There will be one double-gated entrance to the small-dog DFA. The large-dog DFA will have two double-gated entrances on opposite sides, one of which will provide access from the alleyway to the east. An overlook – the center of the park will be elevated to create an ‘overlook’ over the dog friendly area. This might be a site for future sculpture [a statue dedicated to jazz legend Fred Anderson has been discussed], and should provide a space for informational graphics to bring the dog-owning and non-dog-owning communities together. Dog water fountains – there will be at least three different water fountains with dog-bowls and hose connections (for dog water play and maintenance). Equipment gates – an access gate from the east side of the park will allow access for large equipment, and there will be an access gate between the large- and small-dog areas. Surrounding path – a 7.5’ wide perimeter path will surround the dog-friendly area and connect the various parts of the park together. Shade structures – there will be shade sails installed around the dog park to provide protection from the sun and from the weather. 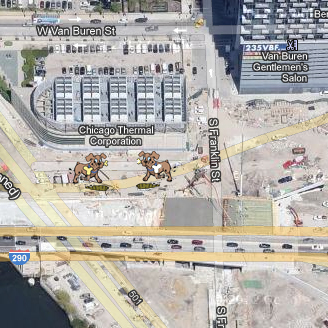 South Loop Dog PAC has suggested a shade sail over the stage area, as well, in order to provide protection for performers and to reflect its use elsewhere in the park. 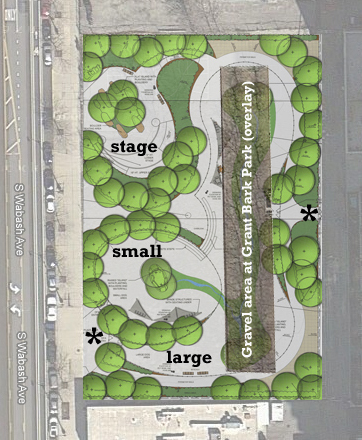 Performance area – there will be an ~1000 sq ft performance stage anchoring a ~4500 sq ft ‘performance area’ at the northwest corner of the park. There will be seating and, we hope (per comments made at the community meeting! ), some kind of performance lighting provided. Water features – the water feature seems particularly novel, as park users will press a switch to turn the flow of water on and off. Water will flow through a ‘concrete runnel a few inches deep with small stones and boulders embedded’. Overall, it seems like an exciting plan! We are particularly interested in what you think about this proposal, and we welcome your comments below or by email. We expect to continue discussion with the Chicago Park District about this park, and will be sure to communicate your comments and concerns to them. Jill’s Tips – Holiday dos and don’ts for dogs and their people! Happy Thanksgiving to all! I trust that you all enjoyed your family gatherings and gluttonous feasts. I probably should have posted this prior to Turkey Day instead of the day after, but we can use the Thanksgiving hindsight to better prepare for the remaining holidays of 2012. What can your dogs eat from your holiday table? • Turkey, ham, roast beef. Lean proteins are okay to share with your dogs in moderation. The meats themselves should not pose a problem to your dog’s system, unless you are already aware of a poultry allergy, which is common in some breeds. The problem to watch for is the seasoning. Too much salt can cause them some distress. Same as in people, too much salt can make dogs bloated and distended, and it can make them drink more water than usual. This could wreak havoc on your walk schedule and your sleep schedule (urgent need for an unscheduled middle of the night walk). Give the new d’Angelo Park DFA some support! The Chicago Park District and Alderman Fioretti’s office have organized an on-site tour of the new d’Angelo Park Dog Friendly Area this Saturday, November 10th at 11AM. They will be asking for your help organizing a DFA support committee and planning future organizational meetings. This may be your opportunity to support your local dog park, from the beginning! We’ve scouted out the park for you, and will soon have information on our Chicago Dog Parks page! Fred Anderson Park – Final community meeting! OK, South Loop dog fans, it really is time for the final community meeting for the Chicago Park District to present their plans for development of the new Fred Anderson Park (16th Wabash Park) and Dog Friendly Area (DFA). Tuesday November 20th 6pm, at the 1st District Police Station, 1718 S. State St. This meeting is important. It will be your chance to see what’s going to be built at the park in 2013, it will provide an opportunity to make your comments and suggestions, and it will allow us as a community to show our support for a new, dog-friendly, dog park in the South Loop.